An Indiana University-Purdue University Indianapolis administrator and philanthropic studies faculty member has received national recognition for demonstrating a promising career as a researcher whose scholarship will shape the disciplines of philanthropy and fundraising. 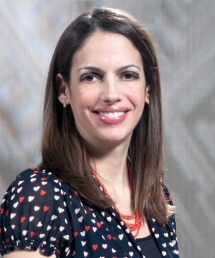 The Association of Fundraising Professionals has selected Genevieve G. Shaker, associate dean for development and external affairs in the IU School of Liberal Arts at IUPUI and assistant professor in the IU Lilly Family School of Philanthropy, as the recipient of the organization's 2015 Emerging Scholar Award. Established by the Research Council of the Association of Fundraising Professionals in 2013, the Emerging Scholar Award honors an early-career scholar or scholar-practitioner whose research has and will continue to shape the discourse on philanthropy and fundraising. "The Emerging Scholar jury recognized Dr. Shaker's extremely impressive training and experience," said Russell James, chair of the association's Emerging Scholar Award Committee. "Her research provides a greater understanding of academic workplace giving and motivation of faculty in seeking academic careers. Her work will further enhance fundraising strategy development for the field and will provide insights regarding donor motivations, interests and giving trends." Emerging Scholar jurors rated nominated scholars on their record of scholarship; demonstrated evidence of a further promising career as an academic researcher or scholar-practitioner; demonstrated impact on the state of scholarship or advancement of knowledge; and evidence of impact on fundraising practice. "I'm humbled to have been chosen by my peers in AFP for this wonderful award and grateful for the support I have received at IUPUI to pursue my research interests as well as to serve the university as an advancement professional," Shaker said. "I'm looking forward to the opportunity to make further contributions to the field, higher education and society." Shaker, who is also an adjunct professor of liberal arts, focuses her research on workplace giving and higher education advancement, as well as the faculty profession. She has been recognized with several other national awards, including the Dissertation of the Year Award in 2009 from the Association for the Study of Higher Education; and, with her co-authors, the 2009 Robert Menges Award for research in educational development and a 2013 Charles F. Elton Best Paper Award from the Association for Institutional Research. "Dr. Shaker has quickly become a highly productive and influential researcher on fundraising within colleges and universities, and especially on the philanthropic activities of faculty and staff," said Bill Blomquist, dean of the IU School of Liberal Arts. "It is very gratifying to see her work receive this well-deserved national recognition through the AFP Emerging Scholar Award." Shaker completed her doctorate in higher education at Indiana University and holds a master's in philanthropic studies from the Lilly Family School of Philanthropy. Since 1960, the Association of Fundraising Professionals has advanced effective and ethical philanthropy by providing advocacy, research, education, mentoring, collaboration and technology opportunities for the world's largest network of professional fundraisers. AFP's more than 30,000 members raise more than $100 billion annually. The AFP Research Council leads the association's efforts to identify research priorities for AFP; recognize and promote research that informs philanthropy and fundraising practice; and translate and disseminate research-based knowledge to practitioners.